Texas Congressman Ron Paul is the runner-up in the New Hampshire primary. The campaign considers this a victory, and it sets the stage for him to take his message to South Carolina and beyond. MANCHESTER, N.H. - In the end, no one was really surprised. Texas Congressman Ron Paul survived the New Hampshire primary Tuesday with his runner-up status intact. The candidate had been polling in second place for days, and voters proved the surveys right. Though the candidate could not overtake former Massachusetts Gov. Mitt Romney's commanding lead, the second-place finish will give his campaign another kick-start in fundraising and momentum as it moves to the first-in-the-South primary Jan. 21 in South Carolina. "We've had a victory for the cause of liberty ... and there's no way they're going to stop the momentum," Paul said Tuesday night in a speech laced with underdog rhetoric and aimed at his fans across the country. "We are dangerous to the status quo!" Watch Paul's speech below, courtesy of PBS Newshour. Texas Gov. Rick Perry, who largely ignored New Hampshire to concentrate on South Carolina, finished in sixth place. He said Tuesday night that New Hampshire's results show that the race for the "conservative alternative" to Romney remains wide open. "I believe being the only non-establishment outsider in the race, the proven fiscal and social conservative and proven job creator will win the day in South Carolina," Perry said in a prepared statement. As of Tuesday morning, Paul reportedly sought to tamp down expectations after polls showed former Utah Gov. Jon Huntsman running close behind him. In the week leading up to the primary, Paul's loyal base in New Hampshire mobilized using traditional campaign tactics, from phone banks to direct mailers. "Ron Paul Revolution" and "Ron Paul Peace" signs hung from offices and bridges. A sizable contingent fanned out across the state's polling places to encourage voters to cast their ballots for the man they described as "the most honest" and the "most consistent" in the presidential race. Many of them came from out of state. Paul also fought off the competition with a steady flow of ads on television. His campaign told news outlets that Huntsman was "not a serious candidate" because he had failed to qualify for the ballots in several states, including Illinois and Arizona. On Monday, a CBS poll showed Paul is also the runner-up to Romney when it comes to electability against President Barack Obama. Paul refused to back down from some of the reforms his critics consider too extreme, including a complete overhaul of the monetary system. Paul has pledged to reduce the federal budget by $1 trillion in one year by cutting departments and reducing overseas spending. As he delivered an impassioned defense of his policies, Paul was flanked on stage by his wife, and some of his children and grandchildren. "We've had enough of sending our kids around the world and spending our money to police the world! It's time to bring [U.S. troops] home," Paul said, emphasizing he would do so "calmly and deliberately." 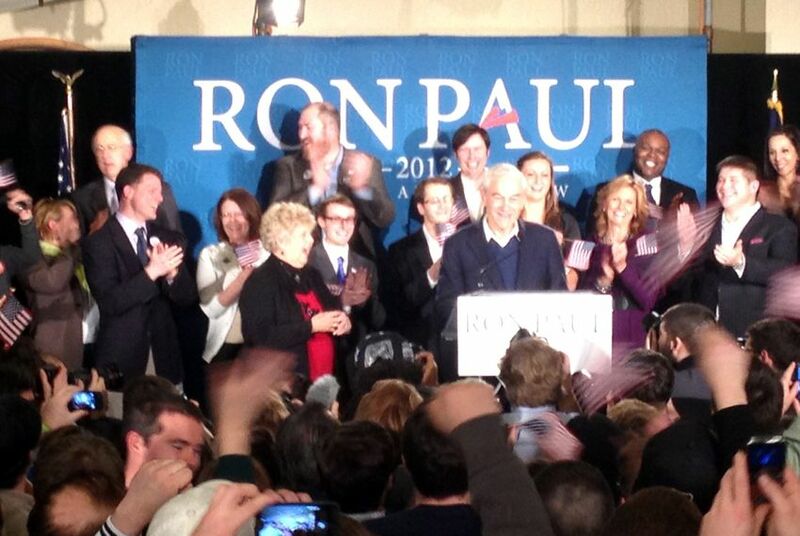 In the audience, hundreds of youthful faces held up American flags, jumped up and down, and chanted "President Paul!" and "Ron Paul revolution! Give us back our Constitution!"